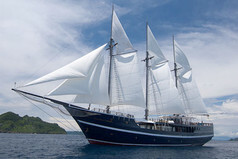 The Raja Ampat Aggressor is a proud 30m motor yacht with a thick steel double hull and distinctive high bow which tours imperiously around the waters of Raja Ampat, Cenderawasih Bay, Triton Bay and the Banda Sea. 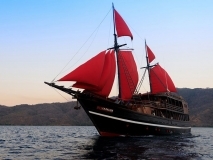 Bringing the Aggressor style to these fabulous Indonesian diving destinations, the crew of 14 will attend to the every need of the maximum 16 guests on board. 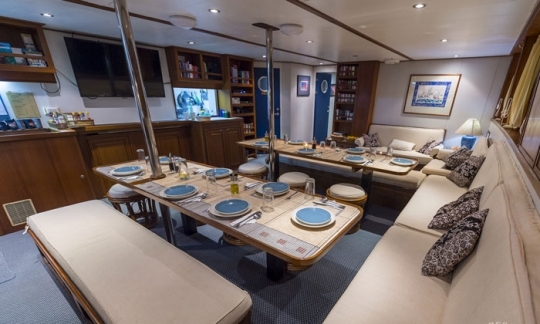 This spacious liveaboard has a roomy, air-conditioned saloon and dining area where guests gather to dine, socialise, use the book library and to enjoy the nightly entertainment including educational marine presentations, and movies. There is also free Wi-Fi on a 3G connection, but signal availability is quite limited. 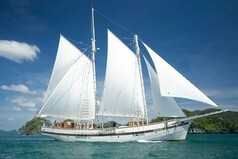 Alternative relaxation space is on the covered sun deck with comfortable wrap-around cushioned seating. 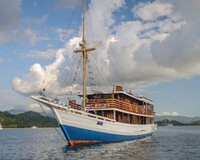 Guests sleep in 8 staterooms all with ensuite bathrooms as well as TVs with USB sticks loaded with audio-visual entertainment. 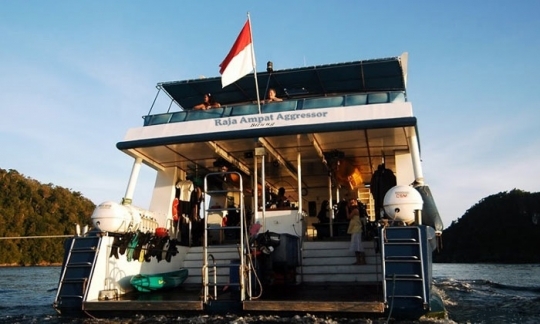 It is in the diving facilities that the Raja Ampat Aggressor really excels. There is a dedicated camera room, a camera table, nitrox, lost diver devices, plus toilets and showers on the dive deck. The deck also includes a 'whale deck' which allows easy access to the water and where the 2 dinghies are stored when the boat is underway. 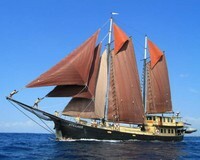 So step on board the sturdy Raja Ampat Aggressor and enjoy a comfortable dive cruise in paradise. 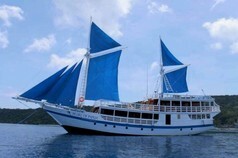 Cruise price per person includes: Cabin accommodation, breakfast, lunch, dinner, snacks, drinking water, soft drinks, hot drinks, local beer and wine (1 glass, the next ones are US$ 5 each) with dinner, transfers to the boat from the airport, dives, experienced English-speaking divemaster(s) (6 divers per DM), tanks, weights and weightbelts. 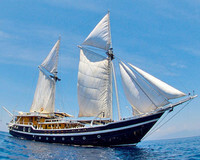 Cruise price per person excludes (mandatory, unless customer provides own): Scuba equipment 7N - US$ 175, 10N - US$ 260, dive computer, marine park fees (per person): Raja Ampat US$ 250, Raja Ampat & Banda Sea US$ 260, Banda Sea & Triton Bay US$ 260, Derawan Islands US$ 250, Triton Bay & Raja Ampat US$ 260. Unless otherwise stated, all the listed items need to be paid on arrival (cash or credit card). 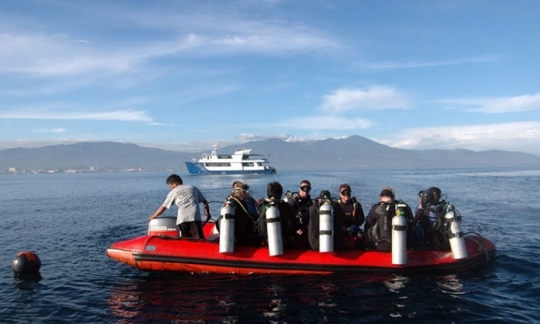 Optional extras: Nitrox: 7N - US$ 150, 10N - US$ 180, dive insurance, torches. 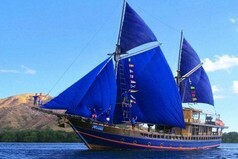 Raja Ampat, Ambon: The Aggressor departs in the afternoon from a number of ports: Raja Ampat - Sorong Harbour, Sorong City (West Palau Province), Cenderawasih Bay - Biak Harbor, Biak City (Papua Province), Nabire Harbour at Nabire City (Papua Province), Ambon Harbour at Ambon City (Moluccas Province), Kaimana Harbour at Kaimana City (West Papua Province), Sangalaki - Tarakn, North Kalimantan. Check your preferred itinerary for departure and return ports. 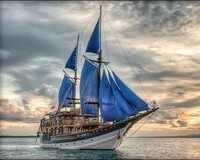 You can fly to Sorong, Nabire, Biak, Kaimana and Ambon from Bali or Jakarta (usually via Makassar or Manado). 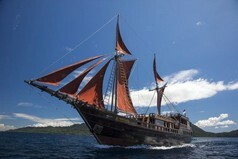 There is a transfer service from the local airports to and from the boat. 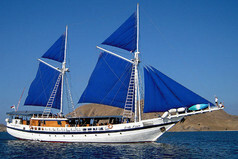 Komodo: Komodo safaris depart in the afternoon from Bali or Maumere. There is a minibus transfer service from the airport to the boat. 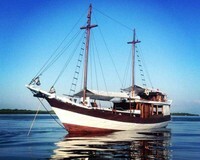 Sangalaki, Maratua: Guests on these trips will be picked up on arrival at Tarakan Airport and taken to the boat, before the 10 hour cruise to the islands. 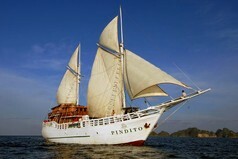 At the end of the trip guests will be transferred from the port to the airport. We will help you arrange return domestic flights. For more information see our travel information section. 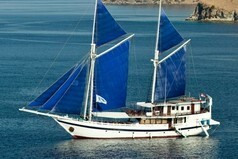 The last dive of the trip will be at around 10:00 hrs. Please wait at least 18 hours before flying after diving. 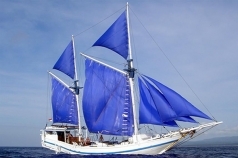 Single supplement (if you do not want to share accommodation): This is optional - single travellers may choose to share a stateroom or pay a supplement of 65% of the published price. Dive clubs and group discounts: Pay for 7 guests and 1 extra person can join the cruise in a Deluxe stateroom free of charge (total 8 guests). 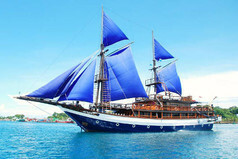 See whole boat charter rates, equivalent to: Pay for 14 guests and 2 additional persons can join the cruise free of charge. 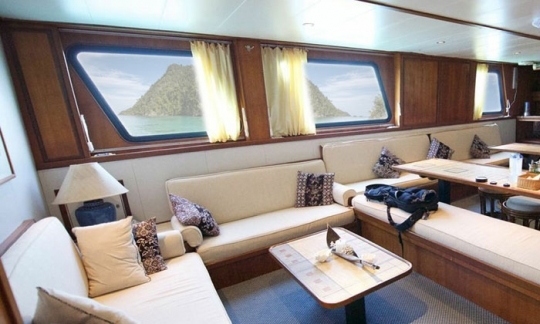 Whole boat charter rate (per night): Raja Ampat: 2016 - US$ 6,030. 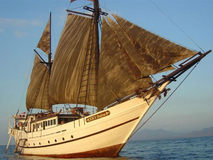 The dining experience on Raja Ampat Aggressor begins each day of the tour with a breakfast of fresh fruit, cereal and juices plus hot entree including eggs cooked to your order. Lunches tend to include more local Indonesian influences and are served buffet style, while dinner is a served affair including various meat dishes, pasta, seafood salad and chef-prepared desserts. 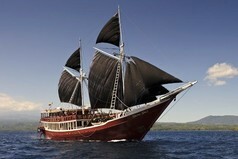 International cuisine mixed with local specialties are to be found on the Raja Ampat Aggressor's varied menu. Main meals comprise breakfast, lunch, snacks & dinner. Bread/toast, fruit, tea & coffee, water, fresh snacks, soft drinks and local beer and wine with dinner are available free of charge. Additional wine and spirits are available as additional extras. The menus are not fixed and meals are served in the air-conditioned dining area. Vegetarian and other special diets are catered for with prior notice. 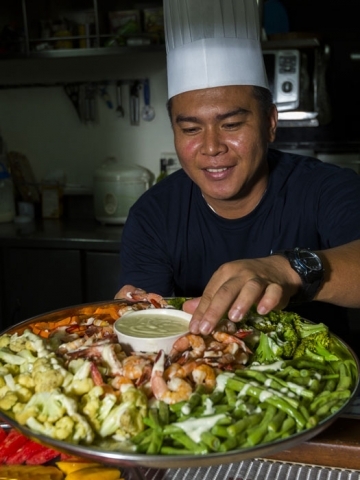 Catering starts with light refreshments and fruit or juice, with dinner on the first full day of the cruise as the first meal.